I think once they come out in plastic I'll be grabbing aquiring a squad or two of SoB (and a cannoness) to ally in as narrative reasons require. ... which look good on the models. But with how paint scheme = rules with most (sub-)factions nowadays, I think I'll be better off rolling my own order with their own paint scheme. If anyone has/knows other alternative paint schemes for SoB, please do tell/post. This is an old photo, I later added some silver to the weapons to break up the bronze. But GW has changed their paints since then, so I'm not sure if I'm doing something different this go round or just continue with this pattern. My Sisters are the reverse of ValourousHeart's, with the armour in red and the cloth in bone/beige. Our Lady of Perpetual Ammunition is painted black with gold trim and blue fabrics. I'm tentatively stealing that color scheme. Very nice! Edited by RandyB, 06 April 2019 - 10:07 PM. Not for the same theme, but I'm planning yellow armor and cream robes for my sisters once the new models drop. Im thinking of using the colours I used for my old Bretonnian army, silver armour and a quartered yellow/black design on any cloth. Or maybe half black half red on the armour? Ahhh choices choices. My girls have naggaroth night purple armour with gold edge/trim and dark purple robes with red inlay and gold trim. I've recently taken to making the leather corset shades of red, and gold on the studs and zip. If you're lucky I might be able to align the stars and actually post some pix, but I wouldn't hold your breath for the quality. Of either the photos or the paint work. Also, there's a bunch of sand/crème/khaki involved on things like wings and purity seals and the recessed bits of tank armour. When plastic sisters will come out I'll paint a full force of my home-brew order (the Order of the Celestial Retribution) in black and brass with yellow vests. Edited by Ezr91aeL, 08 April 2019 - 08:45 AM. You can do whatever combination of colors you want, but going off the major orders you’re right that the sisters use black, red, white, and then gold and silver trimming and basically nothing else for their colors. I prefer to stick to mixes of these colors when coming up with a color scheme for a minor order. 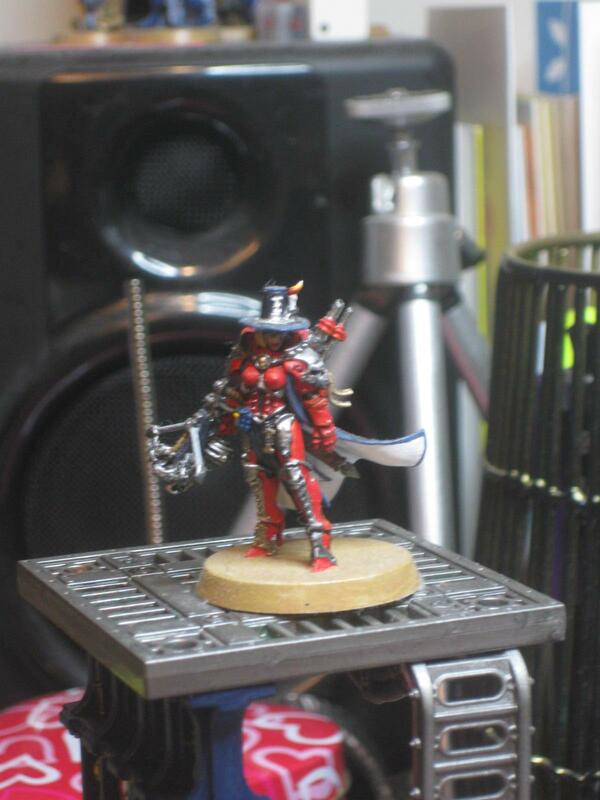 You might want to check out the Liber Sororitas Ordos Minoris and the Tabula Sororitas. Both include a number of DIY orders (the Liber Sororitas shows many while the Tabula Sororitas links to articles with pictures). 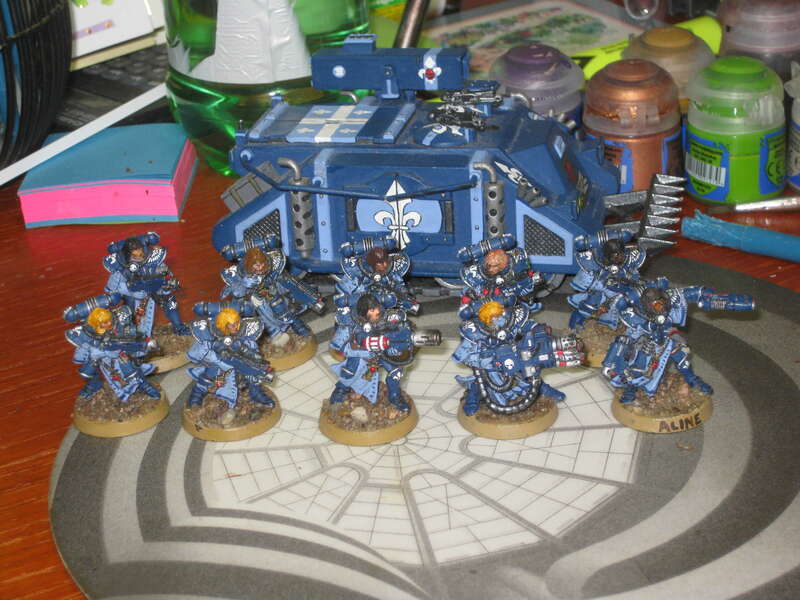 My own DIY Adepta Sororitas order is the Order of the Faithful Sword, which uses dark blue and metallic armour as the primary colors along with halved orange/white clothing. Thanks everyone - you've given me inspiration and a lot to think about. I may be a bit late joining this thread, but mine are in blue and blue. That said, when the plastics come out, I'm thinking of starting a new force with red armour, black robes & white linings - like how I did this inquisitor. Please don't hesitate - if you have a paint scheme which wasn't mentioned/showed yet, I'd be interested to hear/see it. Different shades of the same color is something I didn't consider yet. Thank you. Glad to know that they were helpful. As shades of the same colour, I think it works better with cooler colours (like blues, greens and purples) than hotter colours (like reds, oranges and yellows) as hotter colours tend to blend together visually when next to each other. As well, I think combining a cooler and a hotter version of the same colour works best, as it provides the highest contrast. I think mine would have been better with a bit brighter light blue (or at least some warmer blue highlighting). Finally, when you are doing variations of the same colour, contrasting spot colouring is even more important. For my models, this is in the form of the white fleur de lis and the gold and red on the rosaries and pendants, as well as some brighter hair colours. Edited by Dr_Ruminahui, 15 April 2019 - 05:41 PM. I did warn you not to get your hopes up too high about the pict capture quality. Eddie! How are you? Long time. Sorry been busy with life. Your pics look fine, I have to start all over when they're released. It will be my fifth and last sisters army! I hope. Dr. Rum, beautiful use of blues and the red on the witch hunter is perfect.